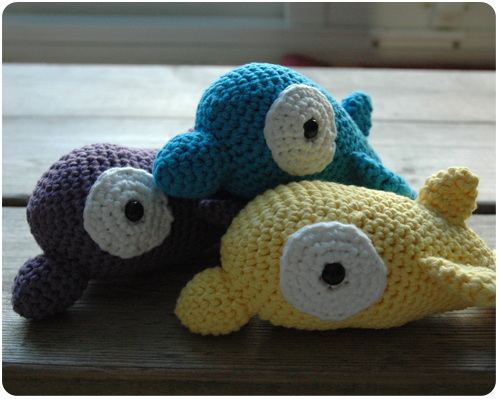 Back in the summer I showed you a crochet dolphin that I made for my daughter Claire. Well, a good friend of mine saw this dolphin and asked me to make three of them for her girls for Christmas. Since this was the first time anyone had ever asked me to crochet something for them I was beyond thrilled to take on the job. My first crochet job! So exciting. Before they get wrapped up and placed under the tree I wanted to show you this colorful trio of dolphins. Aren't they cute? And they were a lot of fun to make. I worked on them assembly line style - making all the eye rounds, then all three bodies and snouts, and finally ending with all the fin and tail pieces. Sewing them together was a little time consuming but also incredibly satisfying to see all the pieces come together. I hope the little girls who these are for have tons of fun playing with them. Adorable and congrats on getting the business!!! How exciting! !